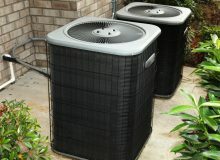 Looking for a new or replacement AC unit can be overwhelming. Sorting through the details of features, efficiency and pricing can seem endless. For example, if your air conditioner or heat pump is more than a 10 years old, upgrading to an Energy Star model could save you around 20 percent on your heating and cooling costs. The U.S. Department of Energy notes that heating and cooling typically account for about half of a home's utility costs. Choosing the right AC installation and repair company is important, since improper installation can not only damage your system but also cost you extra money every month. The Energy Department estimates that improper installation can hurt efficiency by as much as 30 percent, which has a direct effect on your energy bills. Choosing a system that's too large for the space is as much of a mistake as choosing one that's too small. Either way, the unit won't be operating at peak efficiency, leading to higher bills. Additionally, the extra wear and tear can shorten the life of the equipment. We'll guide you through every step of the process and ensure that you end up with a unit that's right for your building as well as your budget.